July, time to escape the heat: 115* weather here in Las Vegas during July. 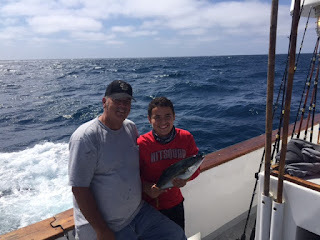 So we head out to San Diego for fishing and baseball. 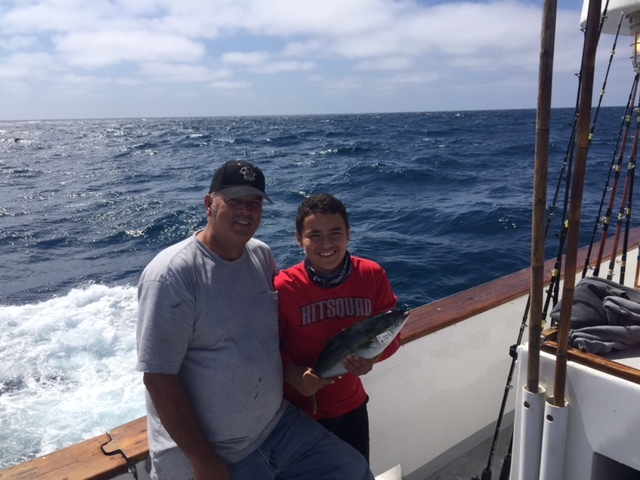 We take our grandson Ethan with us and he and grandpa can go ocean fishing, this time they did the all day boat, which was a nightmare for them, but they tried it, hated it, and will go back to 1/2 day boat from now on. Thursday we left, I had to fly because Charlies car makes me car sick, I flew in got our room at the Marquis Marriott and got settled in, then they arrived a couple hours later and we went to dinner at the Harbor House, great place to eat on the boardwalk, after dinner they had to pack up and get on the fishing boat. They departed at 9pm and would arrive back Friday at 6pm. They thought they would be able to fish all night and day but nope, they had to try to sleep in tiny bunks until they got way out in the ocean, at dawn they got up got to fish a couple hours then head back..so they paid a boatload of money for the same time fishing as a 1/2 day boat!! 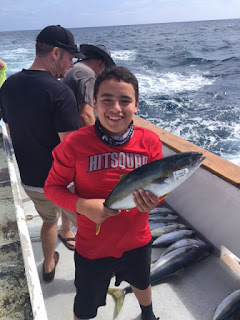 BUT Ethan did catch a 16 pound tuna all by himself! Friday while they were fishing, I awoke to have a wonderful buffet breakfast at the Marriott, gourmet food served there, it was nice that we got breakfast included with the room, that food was wonderful, one morning I had new york strip steak with hollandaise/crab meat sauce, I am still craving that today, it was amazing! 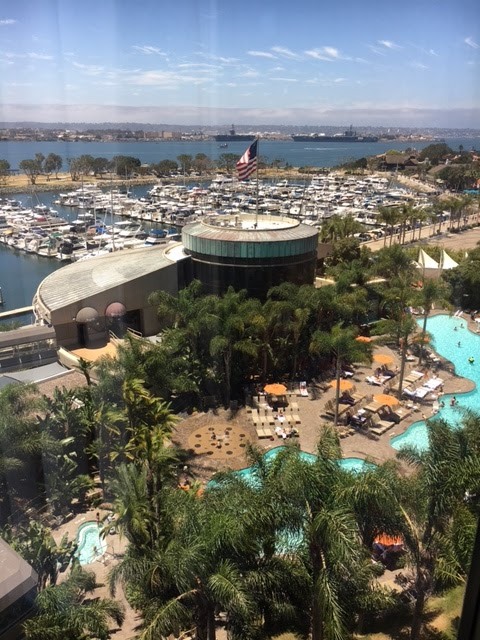 Then I headed out to walk the boardwalk and shop in the shops, later I got back to the room and headed to the pool area, gorgeous pool area there as well, I soaked up some sun and drank a pina colada (because that's what you do while lounging poolside, right?) 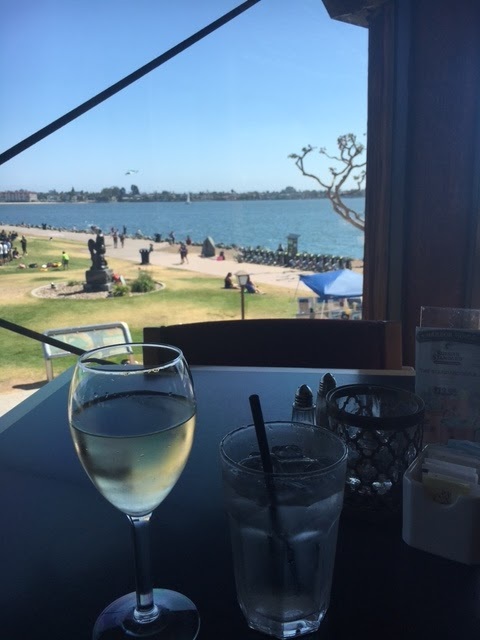 after that I dressed and walked back to the harbor house for a shrimp and lobster roll, salad and a glass of wine. Ahhhh, I love being on vacation! 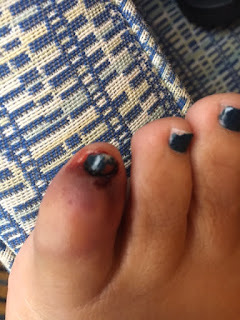 At 8pm the boys got back, they showered and Ethan went to bed, but Charlie was wired so him and I went down to the Tequila bar for a drink, sat by the fire pit and he talked of their adventure at sea! Saturday arrived, mmmm, more breakfast buffet! Then we rode the big Seal bus (stands for Sea and Land) because the bus goes from land to sea, yep, turns right into a boat with out having to get off the bus!! The tour guide Jack was so funny and full of tons of information about San Diego, we drove then sailed around the harbor to see the sea lions, they were lounging on the bait tanks out in the ocean. 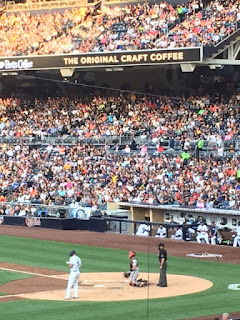 Saturday night arrived and we headed to the Petco park to watch the Padres play the Giants, yeah, go Buster Posey!!! 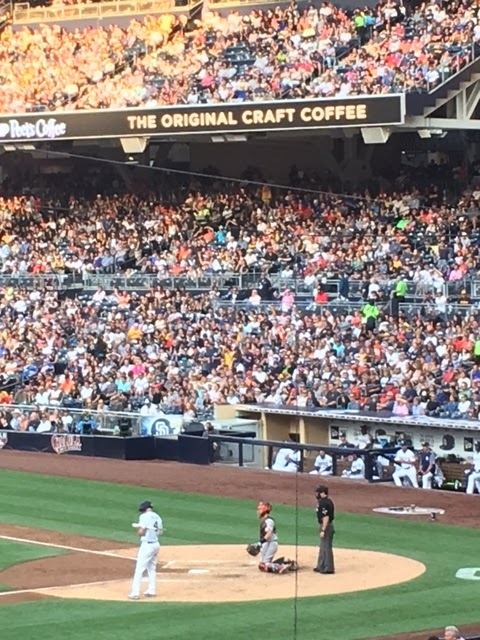 The Padres won, which is great, it is not about who wins or loses, it is all about being there!! Sunday we packed up checked out, (but not before eating the delicious buffet again! We parked the car and went to the early game, left a little early to get on the road home, I did the car ride and was doing ok being in the front seat, we made it home, and that was the end of our annual San Diego trip! View I had having my dinner on the boardwalk! 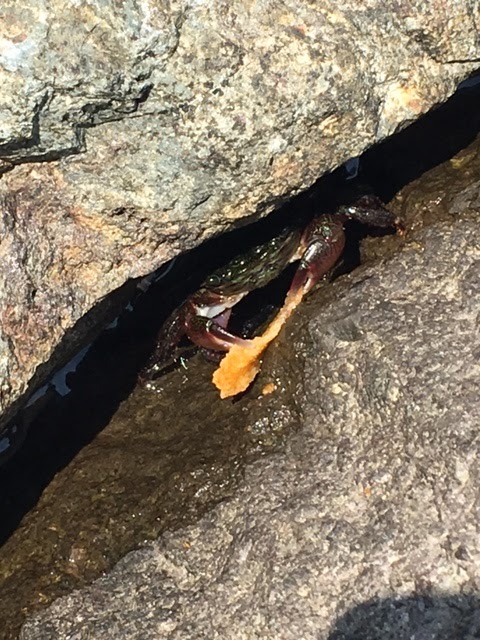 I really had a fun time, even though I was playing on the rocks finding crabs so Ethan could fish, and while escaping the waves I bashed my toe and really messed it up....But this little crab enjoyed eating some bbq potato chips with me! He says "Thanks for lunch"
Well, I hope you get out and have some fun, go somewhere, do something, life is short and time is flying by...so glad we get these times together!